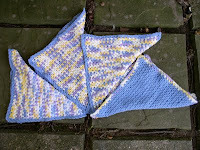 Lorrie knits and sews: Stealth project finished! I mailed it yesterday. It joins the growing list of designs that I can't talk about. I finished a set of dishcloths yesterday. I had been working on them at work while customers changed their clothes. I need something that doesn't require much thought and doesn't have much pattern to follow. I'm reaching the toe of the first CPY mystery socks, the green one. Last weekend we had another family party for Labor day and to say goodbye to a grandson who joined the Air Force. He's now in boot camp. 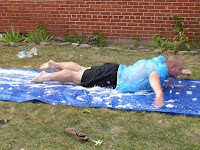 He built a "slip and slide" from 3 tarps and some duct tape. To make it slippery, they used up all their Mom's dish soap and most of a bottle of shampoo that she didn't like anyway. Big kids slid! The bag was supposed to make it more slippery. Little kids slid. They even tried wrestling. It was good clean fun!